Haydn: String Quartet in Eb major, Op.33 No.2 "The Joke"
Representing four different nations, the Gémeaux Quartett is one of the leading ensembles of its generation. During the 2010/11 season, the Quartet made its highly acclaimed debut at the Philharmonie in Berlin. Recent highlights include concerts in Hong Kong with clarinetist Paul Meyer, a performance of Schubert’s Octet with Jörg Widmann and Bruno Schneider, an appearance at the World Economic Forum in Davos as well as a collaboration with the Bundesjugendballet at the Konzerthaus in Berlin. In 2012 the Quartet won 2nd Prize at both the International “Franz Schubert and Modern Music” Competition in Graz and the International “Joseph Haydn Chamber Music” Competition in Vienna. Previous prizes include a 3rd Prize at the ARD Music Competition in 2008, as well as the coveted Audience Award. In 2007 the Quartet won 1st Prize at the Chamber Music Competition of the "Migros-Kulturprozent", were 1st Prize winners of the Basel Orchestra Society Competition and received the Mozart Prize from the city of Lucerne. More recently, the Quartet was honored with the Swiss Ambassador's Award in London which resulted in a tour of England, Scotland and Wales. The Basel based Quartet has a busy concert schedule. 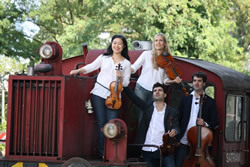 In addition to performances at the KKL in Lucerne, Opera Bastille in Paris, Tonhalle in Zürich, Wigmore Hall and Kings Place in London and at the Philharmonie in Köln, the four musicians are guests at well-known festivals such as the Lucerne Festival, the Schubert Festival in Schwarzenberg, the Rheingau Music Festival, the Heidelberger Frühling, the Kitakyushu Festival in Japan, as well as the Davos Festival. Radio and television invite the young quartet regularly, and they performed on Swiss Radio DRS2, RTSI, Radio Berlin Brandenburg, SWR, WDR, Hessischer Rundfunk and Bavarian Radio. The Quartet has collaborated with artists including Isabel Charisius (Alban Berg Quartet), Patrick Gallois, Bruno Giuranna, Maximilian Hornung, Reinhard Latzko, Jens Peter Maintz, Sebastian Manz, Matthias Pintscher, Christian Poltéra and Julian Prégardien. The four young musicians came together because of their passion for the string quartet repertoire – in 2003 they formed the Gémeaux Quartett at the Hochschule für Musik in Basel where they studied with Walter Levin and Sebastian Hamann. As part of a postgraduate course for string quartets, the Quartet then received further training from the Hagen Quartet at the ‘Mozarteum’, Salzburg University, and continued to work with Rainer Schmidt at the Hochschule für Musik Basel. During 2010/11 the Quartet was "Ensemble in Residence" at the Folkwang Hochschule in Essen and more recently the Quartet lead an undergraduate course for string quartets at the Hochschule für Musik Basel. On the record label GENUIN, the Gémeaux Quartett released the first recording of the two string quartets and the string trio by Pierre-Dominique Ponnelle. In June 2015, the Quartet released their second CD with the Piano Quintets by Friedrich Gernsheim with Oliver Triendl on the CPO label, which was recently chosen as recording of the week on German radio SWR2.